Students prepared to push the start buttons on their robots Thursday at Southern Illinois University Edwardsville. In the old days, children made houses, trucks and crudely shaped animals out of Lego bricks. Now, engineering students use them to learn about computer programming and design. On Thursday, more than 100 college and high-school students gathered at Southern Illinois University Edwardsville for the third-annual Robot Sumo Wrestling Competition. They entered 32 battery-powered robots made of Lego bricks with light sensors and small computers. Students started with Lego kits for robots. Then they customized and programmed them to stay inside a 4-foot-diameter ring and to push, pull, spin or take other action to force out opponents. "It's certainly an exercise in creativity and ingenuity," said Paul Seaburg, dean of the SIUE School of Engineering, which sponsored the competition. Most robots were about the size of a small shoe box. Some had antennae-like appendages with wheels that dropped down for emergency braking. Others had claw-shaped bumpers that pushed, pulled or grabbed. A team of Highland High School students put tank-style tracks on either side of their robot, the Scorpion. They stacked miniature tires on the rear to add weight. "We geared it so it would have torque," said freshman Justin Hatton, 15, of Alhambra . "It goes a little slower, but it's got power for pushing. Some people go more for speed and just try to evade the other player." The Scorpion won several matches but didn't make Top 3. An Edwardsville High School team placed first with Fishtank Assassin. SIUE freshmen placed second and third with Group-10 and Chuck. 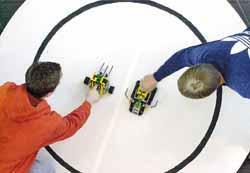 Robot sumo wrestling began at SIUE in 2000 as part of a freshman engineering class. This year, technology classes at Highland , Edwardsville and East St. Louis high schools joined the fun. Between matches, students hovered over laptop computers and cases of extra Lego parts. Competition rules allowed teams to rebuild or reprogram robots after discovering flaws. Edwardsville seniors Sean Seckler, 17, and Michael Currier, 17, increased power by adding a motorized bumper to their robot, Gooey Butter Cake, named after a favorite snack. East St. Louis junior Anthony Simms, 17, helped build the robot UTB 2004. His favorite part was predicting the strategies of opponents and trying to outsmart them. "We're learning a lot about how to improve upon what we've done," said Arthur Robinson, who teaches computer networking at East St. Louis Senior High School . "This is new to our program. We're just getting our feet wet." Some teams received help from mentors in the community. Randy Hamilton, an engineer at Bassler Electric, gave Highland students pointers and cheered them on during competition. "We're hoping to keep the robots and maybe put on a little show during the halftime of a basketball game and let the fans see it," said Chris Durbin, Highland drafting and technology teacher.